Well here we are at challenge seven, just this one and one more to go. Mad WoMEN – Our guest judge this week is the owner of the fabulous Dressmaker Details. This line is famous for it’s fantastic cocktail fashions with that 60’s flair. Your challenge this week will be to design the perfect cocktail fashion for your model, who by the way will be wearing your design as she guest stars in an episode of the wildly popular TV series Mad Men, entitled, The Cocktail Party. Another 60’s inspired challenge? Well at least I’m in the mode for it and I can be much more creative with this one. Cocktail huh? Looks like 60’s cocktail seems like alot of sheath dresses and bateau necklines. I’ve never seen Mad Men-I’ll put it in Netflix queue and check it out. 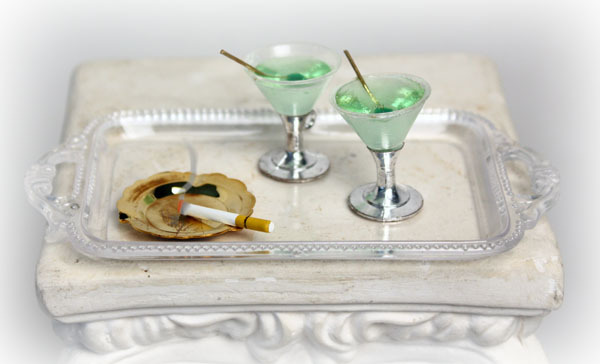 At least I have some great props- including a cigarette and cocktails (if I can just find them! LOL). I spent the morning going through vintage patterns, Mad Men images, L’Official mags from 1960 and some of my designer books. Getting a feel for 1960 cocktail dresses, dresses with coats or short jackets. 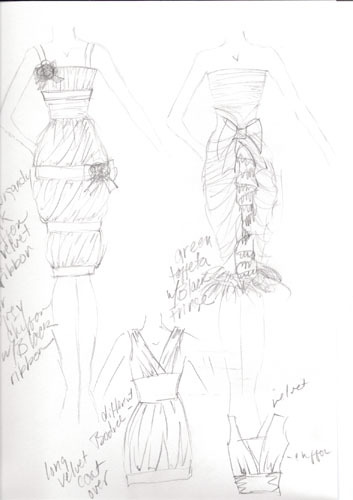 Sheath style or semi full skirt, pretty simple in design. Lots of brocade, beaded bodices, and fur. I think I need to figure out my model. Trapeze Sybarite-I used for the first challenge- has that 60’s look to her. 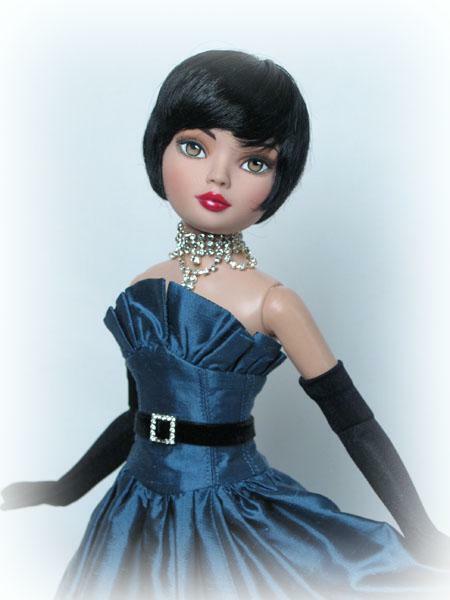 Wouldn’t it be a hoot if I used an Fashion Royalty doll (12″) or Barbie? No one would expect that from me. Only thing is, I’m not inspired by them and my clientele is for the 16″ girls. I’m also thinking of using Psyche (Grey) again. She kind of has a the 60’s inspired makeup but not as drastic as Trapeze. Besides she won it for me in challenge 2. 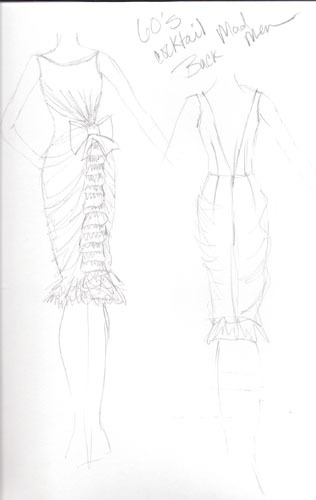 I have two designs drawn out, one with two neckline variations. I have to think of color- one of them I think would be superb in a kelly green silk taffeta. I’ll have to take pics and see how it photographs on Psyche. 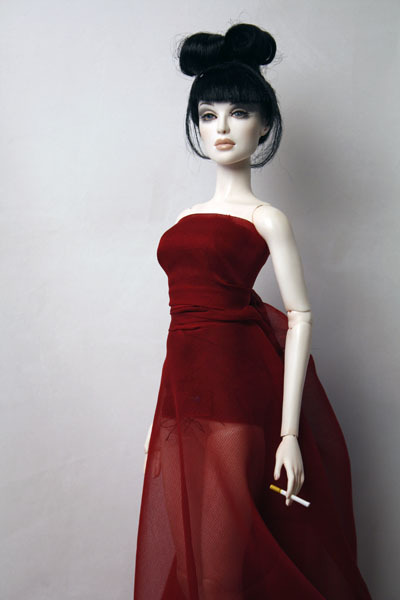 The other is a deep red silk chiffon or grey silk chiffon with black velvet bands. I also took some pictures of Psyche in the color fabric I would like to use to see how she photographed in it. I really like the red but am leaning towards the design I would do in green. 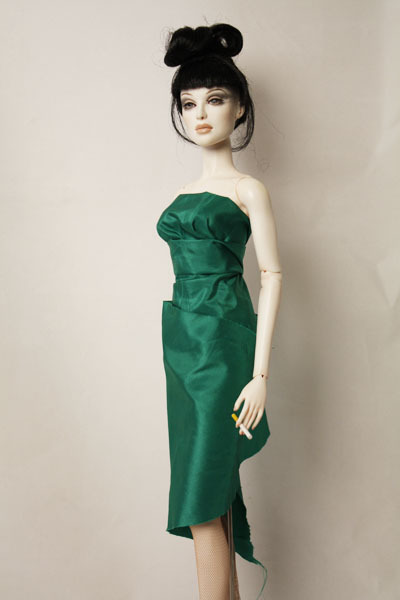 I ordered some new wigs, two in shades of red, so they might look awesome on her in the green taffeta. It would be very Mad Men, kind of like Joan, but I need to make sure I keep it different as well. I don’t want to do a character on Mad Men, I need to create a new character that is guest starring. 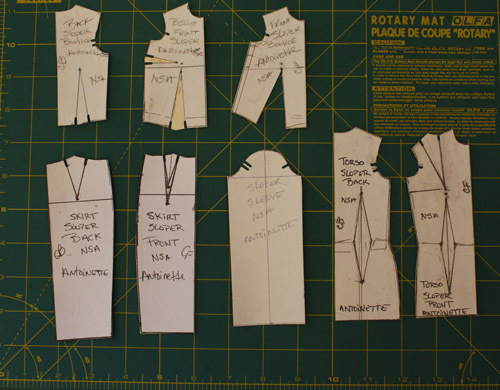 I got my patterns drafted and now it was time to make the toiles. I’m not sure about this skirt style now that it is made up in muslin. 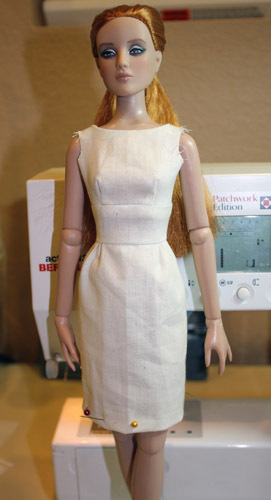 I’m thinking it might be a little ambitious and too busy for the sleek style that the Mad Men fashions show. 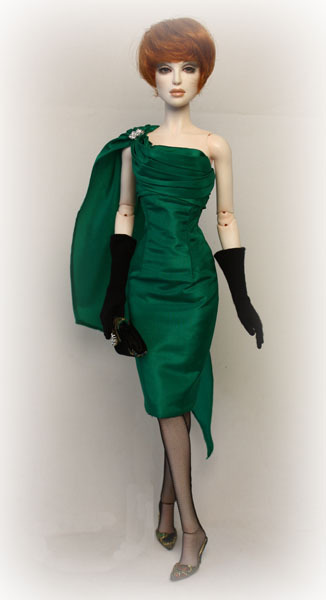 If I take out some of the ruching- it may start to look like Joan’s green dress. Maybe I shouldn’t even use green, but it just looks so great with the carrot red wig. I guess I could try grey, but I’m running out of time to be so indecisive. I researched some more and more and more. 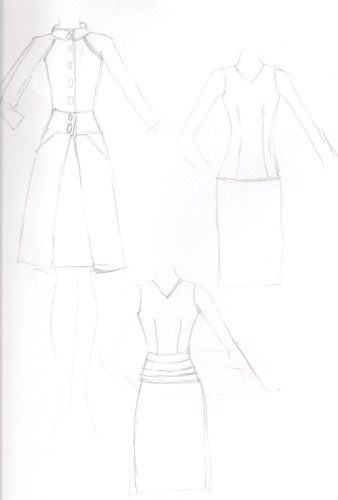 The images I could find and what I have watched off the show (mostly beginning of S1) the fashions are pretty simple. So I really need to stay simple to an extent to stay in the theme of the show. I don’t know how that will score in originality and creativity points though. I don’t know how one can do vintage design and still make it original. I’m worried about being too simple but that’s what won me the Audrey challenge. I’m wondering if I should go with the red chiffon now-because it’s a little simple but yet has some difference. I should just whip it up and see. I came up with another design. Took the ruching out of the skirt and placed it along the bodice. 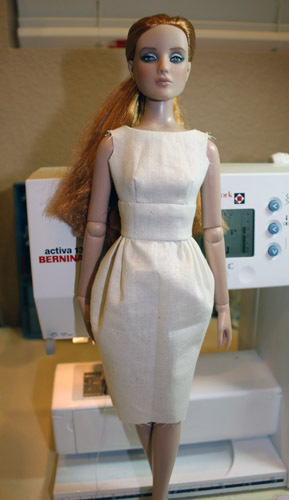 Started draping the fabric around the doll with to get an idea. I like this, slim cut with interest at the top. Today was the morning of all mornings. Yesterday I got quite a bit done on my dress, since I finally figured out what I was doing. When I get up in the morning, I usually look at the work I did the night before because my sewing table is right outside my bedroom. Well, I took one look at my doll I was using,(she was lying on the table) and her wig was gone!! My little kitten(who is now 6mo old and getting into everything, as of this writing she has also lost one of my chipped off doll fingers I needed to glue back on) took it off her head. I’m pretty sure it was my kitten because I heard her messing around my sewing area early this morning after I kicked her out of my room. Now I can’t find it and that was the wig that made my whole look. Hopefully my daughter will be able to find it-it’s her mission today. Then to top it off, I spilled a little coffee on my dress that was lying on the table. Not my morning! I’m hoping it doesn’t stain, although silk taffeta-oohhh. So again I am going to be rushing last minute to get this done. I will be so glad when this contest is over. I had debated whether to compete or not, wondering if I would have the time. I’m just hoping we find the wig and it’s not torn apart. I spent the day finishing up the dress and making the accessories. I went with some black Chinese dragon print brocade for mules and a clutch. I made some gloves with some of the individual fingers separated because I really hate those mitten style ones and Grey has such beautiful hands. But boy were those a b! @#*to make. And they are kind of bulky so I won’t use them too much. Got my pictures taken and submitted with less than two hours to deadline. The designs are posted, and there are some really good ones in there. Emilia’s is very unique- funny I have that same brocade-I looked at it once for this challenge but really had wanted to do a bright color. #6 is really nice too and right on target with the early sixties vibe. Kathi’s is really nice and her construction is perfect. So this is going to be tough-I really don’t envy the judges. I received an email from Larraine today. It appears that I am in violation of one of the rules #2. Designers must submit original designs. Commercial or any other type of purchased patterns are not allowed. Anyone using patterns will be removed from that individual challenge; subsequent use of patterns will require elimination from the CDDC. It is the original part that concerns her. Four of the designers had contacted her about my design being a direct copy of a dress from this site that was posted on the CDDC group. Oh no, what am I to say- It does look like a copy and I didn’t even realize it. I had failed to differentiate what I had seen with the images I designed in my head. This is going to cost me this challenge probably. I should have recognized the resemblance, but with the pressure of the time and my brain being on design overload I failed to. Maybe I can still defend myself. I was so busy yesterday Christmas shopping with my husband, I didn’t have time to do anything about my design. For the moment Larraine and I agreed to keep the images on the site-I was hoping the judges would still score, but she told me a few of them felt uncomfortable scoring it. They were all very saddened by it but were equally impressed by the design. Even though I couldn’t work on anything yesterday it still tugged at the back of my mind. I was kind of sick to my stomach all day knowing that all this hard work is being thrown away. I was also thinking about what I might be able to do to save it still. I’ll change the design around some to make it no longer look like a copy but still keep the look I was going for. 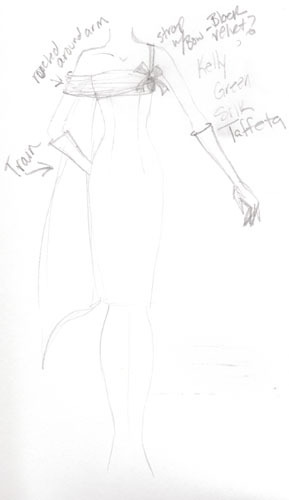 If I use the original dress and just change-using the original as inspiration maybe the judges might give me a chance. The Cocktail Party- It’s 1960 and famous french fashion designer, Chantal Delacroix, is launching her first perfume, Mysterieux, in the United States. She hires famed advertising agency, Sterling Cooper, to develop the advertising for it’s debut. In honor of her arrival in New York, Sterling Cooper is throwing a grand cocktail party. Chantal arrives in a beautiful green silk taffeta, slim cut cocktail dress. 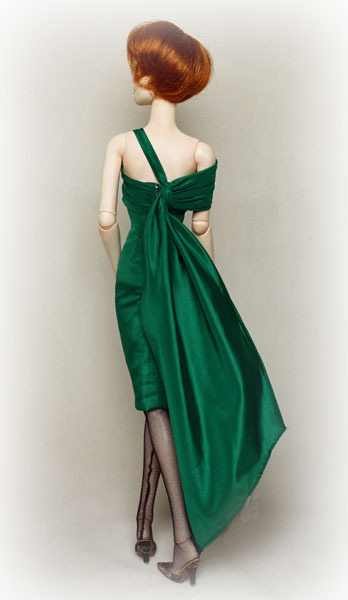 The drape seems to roll up around the body and ends in a train effect in the back. It encases one shoulder leaving the other bare with but a single strap ending in a bow accenting the bodice. Fully lined in white silk taffeta. 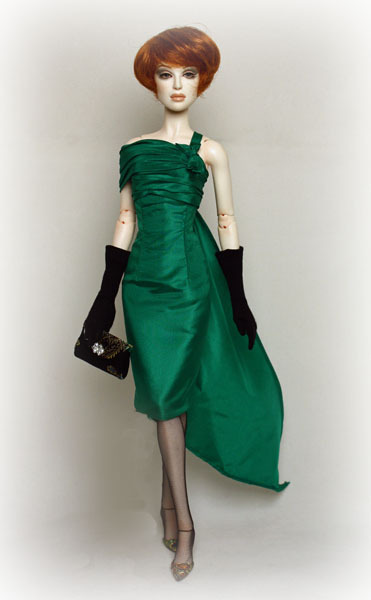 Her accessories are black Asian printed silk satin mules, with a matching clutch lined in the same green taffeta as her dress. She also arrives in black gloves that she removes shortly after arriving to the party. Chantal Delacroix is Numina Grey by Paul Pham. Larraine agreed to discuss this with the judges so now I just wait. The judges need to stand by their decision-it needs to be disqualified other wise it will show special treatment. It is unfair to the other designers for a new submission because I had already seen the other designs by now. Not that it put any influence in my new design choice. I would not have let it- I stayed with my own aesthetic. I understand and respect the judges decision. I figured it didn’t hurt to try. I’m hoping this doesn’t put me back too far. I know I have no chance of winning this competition now- which is too bad because I have worked really hard and really embraced this competition to my surprise. I know a lot of the designers probably even wondered why I entered. I did it on a fluke, my family is always asking me why I don’t try out for Project Runway, so this was the thing that was similar but in my interest. I wasn’t sure what I was in for-it has proven stressful, fun and challenging. I have met some new friends in the doll world and I hope to keep in contact with them even when this is over. And hopefully Larraine will continue with another contest and maybe I’ll be a judge-that would be interesting too. Maybe she might consider that. I did get scored on my design from two of the judges even though these score will not count. I finally got solid 5’s from Shane and I was very happy about that for some reason. A gorgeous fashion, meticulously constructed. Beautifully made, great attention to detail and scale, even the revised one was just as good, amazing talent under pressure. Well, now I am in 8th place with a total score of 435. Even if these two scores could be added I would be in 5th place with 475, one under Kathi. I’m sorry that this happened but you live and learn. I’m still continuing since there is only one challenge left to go. Inspired by Audrey – This week’s guest judge takes his inspirations for his incredible collections from many areas. This week you must take on a muse that has inspired Randall Craig himself. 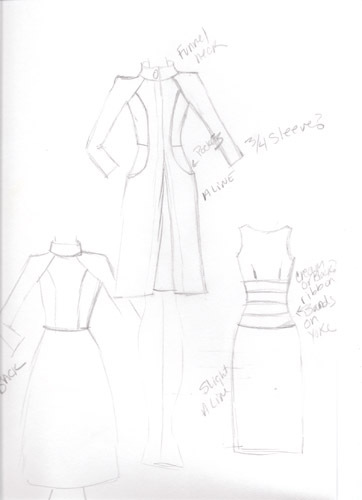 Your challenge this week is to create a design that is Inspired by Audrey(Hepburn). This should not be a remade or copied Audrey outfit, but something that you have designed that would suit Audrey’s style and be something Audrey would have loved to wear. I love Audrey Hepburn. When you think of her what comes to mind? Elegance, classicism, Breakfast at Tiffany’s, but most of all Style. 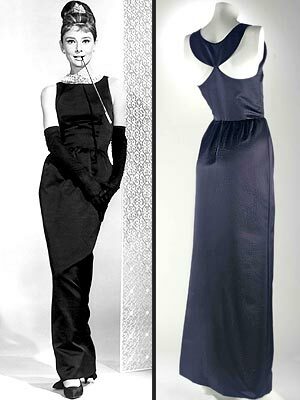 Along with her good friend Hubert de Givenchy, the two of them created a look that has survived decades. I went to the library yesterday and picked up some fashion books and one of Audrey’s personal life. I have been looking through them and think I have a concept of what to do. 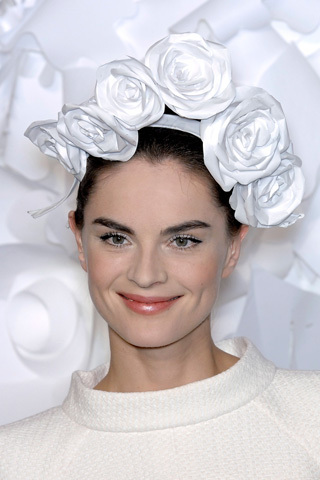 I also had looked at runway shows of recent- especially Chanel’s Spring 2009 Couture all white show. And of course surfed the net for info on Audrey. She was classic in her dress- her style emanated from within her, but quality was of most important. So I must use good fabrics and clean lines and make sure it is immaculately well made. For this challenge I will go with my muse of Antoinette again. She is perfect for this challenge with her small bustline and slim figure. My Ellowyne, Madly Sadly Plaid might be good too because of her short pixie haircut, and she is small busted as well, but I think she might be too young, not sophisticated enough for my design. The model is everything. I watched a couple of movies, How to Steal a Million,(which I had never seen before, quite enjoyable), Charade(always love Cary Grant), Funny Face (ah the clothes) and of course the all time favorite Breakfast at Tiffany’s. I watched that this morning. I think watching these just reinforces my decision. I’m going the sixties route-anything retro is always in style nowadays. I made some sketches and narrowed it down to two. 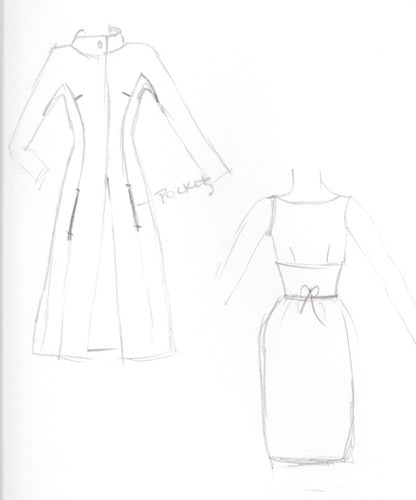 I decided to do a coat over a dress, one is a little more stylized than the other. I made a muslin of the dress-didn’t like it at all- too dowdy. Even out of the fabric it is going to lack, and besides, I don’t think Audrey would do a V-neckline no matter how small it was. Back to the drawing board. I will go with one of my other sketches now. One is more stylized, probably more in tune with today, the other I think is more Audrey’s style-especially more retro feeling. I’ll make up a toile of the dresses and take it from there. 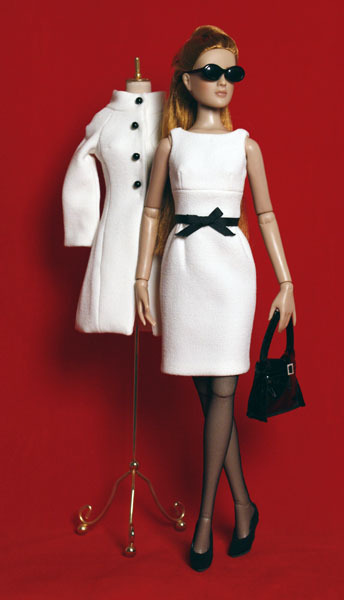 I went shopping yesterday and picked up a beautiful ivory stretch crepe, because the herringbone wool I picked up at Joann’s, as beautiful as it was, I think it will be too heavy for doll scale. That is always a challenge. This one I think ended up too pegged. I love the top, it fits well and I think it will work. The skirt is cute but just not for this challenge. I took out some of the gathers and widened the skirt a bit at the bottom. I think this is what I am looking for. Clean, simple, nice fit and add a black ribbon waistband with a bow-Voila!! (of course it will be made out of the real fabric. I spent all day finishing this challenge. I wish I had the time to finish earlier instead of rushing at the last minute. But I got it done. 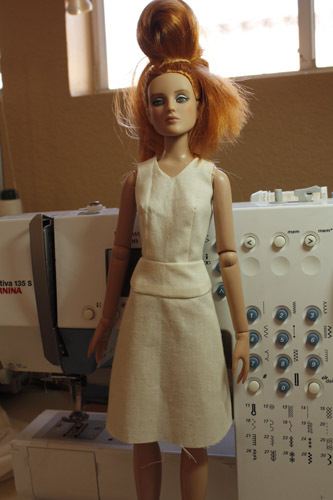 Sewed the jacket up in one day-it was a challenge to draft the pattern for it, raglan sleeves are not easy to do the proper way and in doll size. But I have to say, I think the whole look is classic & very Audrey. I don’t know what kind of points I’ll score since it isn’t very original just classic. It’s hard when we have these vintage challenges to do- everything seems like it has been done. We’ll just have to wait and see. I had finished at the last minute again and therefore my pic is one of the last ones on the page. I really want to get this next challenge done early so my pics will end up one of the first on the page. There are some really nice entries again. I think #2 is going to win. I’m not sure who did it, but I do know which one is Emilia’s and Louos’s(since he gave a hint on the board, I can tell his style). Anyway, #2 is very cute and inventive. Mine is so simple and classic- but then that is how Audrey was- so maybe I’ll still get decent scores to keep me in place. At least my construction is perfect. Now it’s just waiting on the scores and onto the next challenge. December 6-Challenge Scores are up! On weekend mornings I have a routine- make my coffee, and read my emails. Boy was I surprised when I saw the email from Larraine stating that I won challenge #6. I won? Totally unexpected. I thought for sure #2, which ended up to be Dal’s was going to win for sure. I thought it was so cute, and the cape was beautiful! Kathi’s was really nice too and classic Audrey, and Emilia’s was so creative. I am very happy I won, I put alot of effort into this challenge and it paid off. I am still second overall with only one point behind Emilia now. This fashion meets the theme 100%. I can absolutely picture Audrey in this. It’s beautifully done. So perfect. The monochromatic effect leads the eye to the lines of the garment. Great back yoke seam. It’s beautiful. I like the lines in the coat the unique raglan sleeve. Stunning tailored suit! A perfect solution to Audrey’s classic elegance. This design is timeless in its sophistication and perfectly contrived. Absolutely dead-on and FABULOUS! It’s simple but not the least bit boring. The seam lines add the perfect amount of interest to a primarily off-white garment. The hints of black balance it out perfectly. The quality is stunning and professional. I can’t say enough … I love it! Total points 78, first in challenge, second in overall competition. I think Randall did a great job of judging and comments. A question was asked on the board(yahoo) about what to take on judges comments. As Dal said on the board, ‘Judging is subjective just as we are with fabric and design choices and even with the entries we like here in this challenge.’ And she is so right. I also think that it helps to know who your judge’s are-what their design aesthetic is, to determine what their taste is. But overall, I think you have to be true to yourself. And follow Tim Gunn when he says to the designers on PR, Edit! !